Longhorns still hold tiebreaker over Sooners. OU has yet to face West Virginia. Texas has league's fifth-best offense and ranks fifth in points allowed. Texas’ six-game winning streak grossly distorted the outlook on what is still a program in rebuilding mode. Texas was back to being competitive again, sure. But back to winning championships? Well, not just yet. That was plainly obvious against Oklahoma State and again in Saturday’s 42-41 loss to West Virginia. 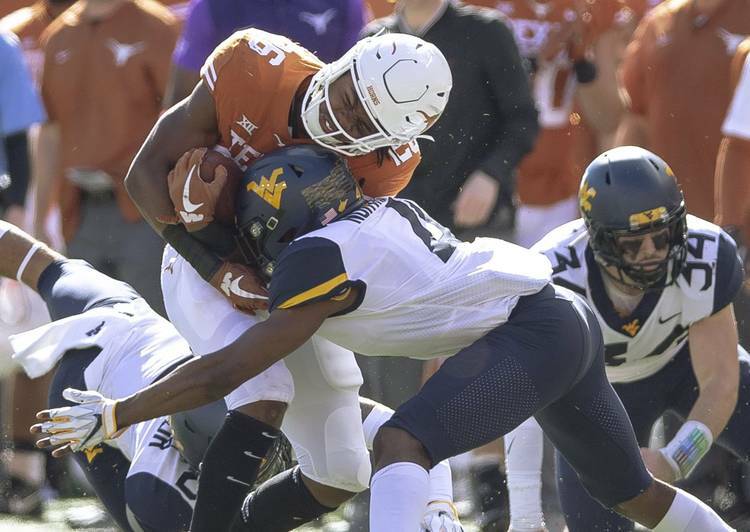 “These guys are going in the right direction,” WVU coach Dana Holgorsen said of Texas. But the right direction to the Big 12 championship game or the Texas Bowl? The Longhorns weren’t considered to be Big 12 title contenders in August. But wins over USC, TCU and Oklahoma changed public perception. Now, there’s escalating fear that No. 17 Texas (6-3, 4-2 Big 12) is suddenly out of the league race with three regular-season games left. Perhaps not, though. Texas Tech quarterback Alan Bowman suffered a reoccurrence of a collapsed lung injury Saturday night against Oklahoma. He was hospitalized and is status for this week’s game against the Longhorns is unclear. The Red Raiders (5-4, 3-3) are a different team without Bowman, so the Horns’ trip to Lubbock may not be as difficult as once feared. Also, Oklahoma (8-1, 5-1) still has yet to play West Virginia. If the Longhorns win out and the Sooners lose to the Mountaineers, then UT will have the tiebreaker advantage over OU. Bolts are coming loose and she’s starting to shimmy, but this roller-coaster continues. Essentially, Texas has no margin for error at this point as far as the Big 12 title is concerned. As far as Texas has come this season, the last two weeks should be a strong reminder of how much work remains. This is not a complete team. There isn’t much depth behind the 22 offensive and defensive starters. Texas has an adequate but average running game, and there isn’t enough pass rush. The defense was down three starters by the end of the second possession on Saturday and ended up allowing 578 total yards. Safety Brandon Jones somehow aggravated an ankle injury at the team hotel on Saturday morning. He walked out of Royal-Memorial Stadium wearing a boot on his right foot. Cornerback Davante Davis suffered a shoulder injury on the game’s second play, and defensive end Breckyn Hager dislocated his elbow on West Virginia’s second drive. All of their backups are backups for a reason. Facing one of the nation’s best pure passers in Will Grier, Texas had no sacks and only two quarterback hurries. He was upright and clean almost the entire day. Grier completed 28 of 42 passes for 346 yards and three touchdowns. Grier’s successful two-point conversion run didn’t cost Texas the game. The game was lost in incremental ways, like when David Sills V ran straight past Caden Sterns for a 60-yard score and flashed the “Horns Down.” Or when Martell Pettaway literally ran straight through UT defenders en route to a 55-yard score. Or, how about when Texas quarterback Sam Ehlinger’s helmet popped off on fourth-and-1 at the WVU 5? “It was pulled off,” Ehlinger said. Officials decided that Ehlinger’s helmet came off before he reached the line to gain. By rule, the play is instantly dead. Ehlinger got the first down. Instead, WVU took over because the play was technically short. Or, how about when Herman elected to kick a field goal on fourth-and-1 from the WVU 21 in the fourth quarter? The aggressive coach suddenly turned conservative. Cameron Dicker’s 38-yarder gave Texas a seven-point lead, something West Virginia erased about four minutes later. These are all championship-winning moments that went by the boards. And facing a team with equal or slightly better talent, it added up to a loss. The sold-out crowd of 100,703 left deflated and dejected. At this point, the Longhorns are who they are. They’ve got the fifth-best scoring offense in the Big 12 and the fifth-best scoring defense, which measures points allowed. They are sixth in total yards and sixth in yards allowed. All in all, average. And yet, they have three winnable games left on the docket. Every game left will boil down to a handful of plays and coaching decisions, just like it did against Oklahoma State and West Virginia.